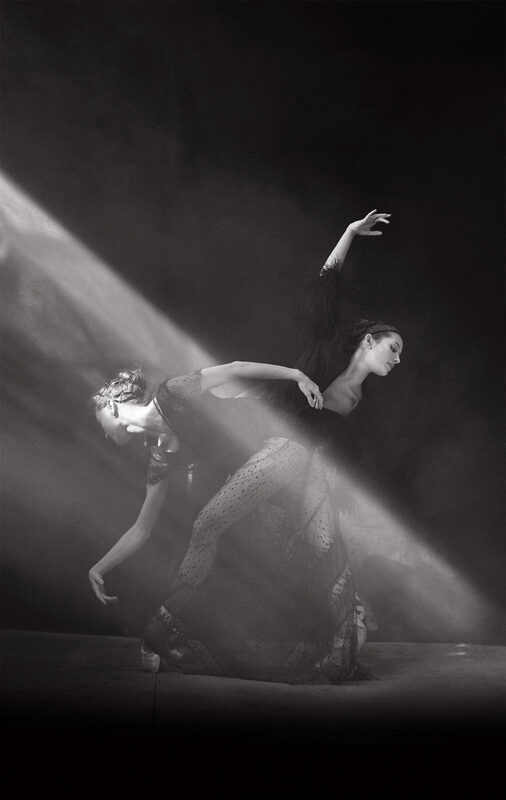 MONROWE is pleased to present a portfolio from Peter Lindbergh’s campaign for the New York City Ballet’s 2016/17 season. Thanks to the New York City Ballet, which published an earlier version of this interview. It is now after midnight in Paris. Peter Lindbergh the photographer and I have been talking for much of the day. He is home. I am in New York. We’ve discussed his early interest in becoming a conceptual artist (and making “big” paintings before that). Silent German cinema and Berlin cabaret have been topics of conversation too. We see one another on Skype. Behind him is a school clock, a window, and more art books than can be imagined. For my part, I have been trying to ascertain what influence dance has exerted on his work. The poise of arms and hands. The way a back is arched or a leg is extended. Poses where every muscle seems tensed ready for a leap. I ask about Naomi Campbell’s complaint that Lindbergh made her wear ballet toe shoes and stand en pointe for their first fashion shoot at the start of her career. And I even suggest – after seeing film footage of Lindbergh showing fashion models what he’d like them to do in a series of steps, waving his arms, shifting his hips and tossing back his head –that he goes about his work in exactly the way that a ballet choreographer constructs a dance. He laughs. After a long pause, he explains that’s not it. What’s important is for him to feel for himself exactly what and how his subject feels. For the better part of 40 years Lindbergh has been regarded as one of photography’s masters. An artist of shadow and available light, his fashion stories and portraits of actors and musicians have regularly appeared in all the world’s top magazines, been published as books, shown at art galleries—and increasingly, become the subject of retrospectives at major art museums. His approach, he explains (notwithstanding his patrons’ earnest commercial motives), has never been about the clothes, the location, or even “the architecture” of a face, but very much focused on “the relationship” that is created between the photographer and his subject on one particular occasion: “You do not photograph the person—you photograph the moment.” Often praised as poetic or “dance like,” his images are black & white (with rare exceptions), wholly uncropped, and – at least when he’s gotten his way – unretouched. Moreover, the relationship depicted by Lindbergh is invariably one of equals enjoying a wholly unqualified and unconditional sense of mutual trust. 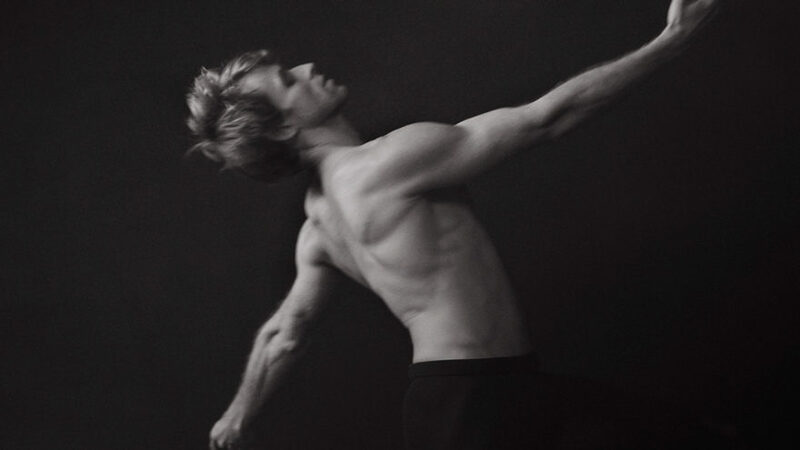 Lindbergh is modest about the occasions he has photographed the ballet – including his portfolio for the New York City Ballet’s 2017 season – contending he “prefers imperfection to perfection,” adding that while he loves dance, there are so many ballet photographers who can see the moment when a dancer is technically impeccable. “I don’t care if the foot is like this or like this,” Lindbergh tells me, gesturing with his hand, “I’m okay with more twisted or less twisted.” What Lindbergh seeks and has always responded to is the “energy” of dance. Its capacity for the poetic. And, as his October shoot of the NYCB radiantly attests, he was also particularly inspired by both the improvisational inventiveness of the company and the remarkably beautiful natural light in the stable house in which he took their portraits. At a deeper level, though, there is Lindbergh’s thirty-year friendship with Pina Bausch—among Lindbergh’s closest friends until her death in 2009. Describing Bausch’s work as a dancer herself in Cafe Müller (in one of the only roles she continued to perform, rather than pass on), I watch Lindbergh’s face light up as he describes how she “hardly did anything.” But that “not one movement was empty.” That “every gesture” had come from something in her experience, and how masterful she was at imagining something of consequence she wanted to say, and doing so with her body. Executive Producer: Ros Okusanya @ ro.